My instructional philosophy is one of collaboration with and respect for the students in my classes. My courses are predicated on active engagement and participation from students in the classroom, whether physical or virtual, asynchronous or in real-time. Whether teaching at the undergraduate or graduate level, I am committed to creating a safe and welcoming environment for all the students in my class. I believe that this baseline is fundamental to allowing for a critical approach to the topics we study, and for students to endeavor to push their own boundaries to explore alternate, new and challenging theories and ways of knowing, seeing and understanding their media and their world – my ultimate and fundamental measure of my own success as a teacher. 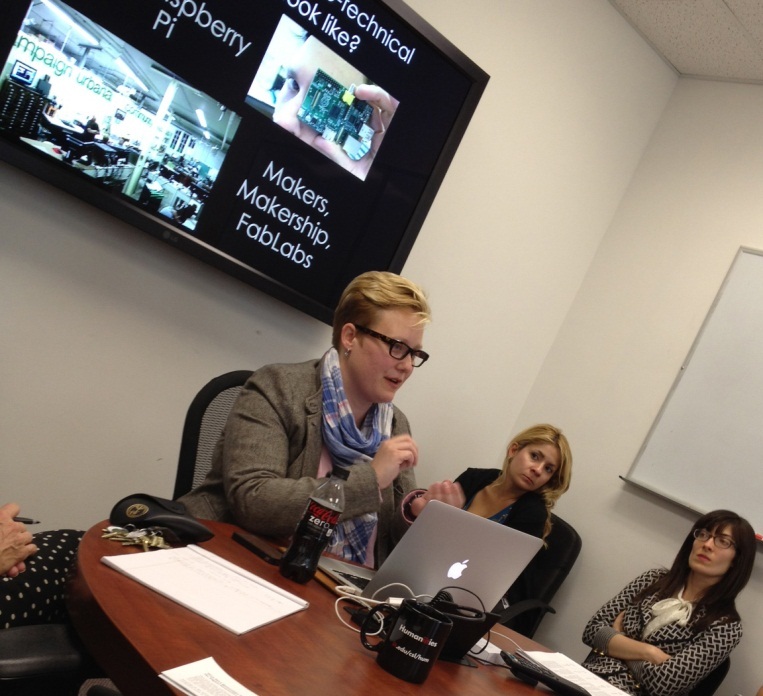 Talking fab labs and Raspberry Pis at IIT. Given that the subject matter of many of the courses I teach frequently touches heavily on digital/social media and other real-world technologies (e.g., digital library platforms; digital tools), I believe in helping students become active users and critics of the technology that so often they simply consume (or that is used to consume them). I believe that, through exposure to the full ecology of historical tendencies, market forces, and the economic, sociocultural, and political implications of technology, as well as through hands-on experience to learn to create and not just consume digital media, they can become savvy participants in the digital media landscape. My courses at both the University of Illinois at Urbana-Champaign and the University of Wisconsin-Madison range from the highly technical with practical hands-on learning components (Digital Libraries; Electronic Resource Management) to those that are more theoretically, historically and philosophically grounded (Information Ethics and Policy; Libraries, Information and Society). From my course planning through to delivery and in relationships after class has ended, I attempt to reflect the thought and care I put into my teaching, and engage students creatively using participation and assignments that challenge them, while underscoring the theoretical principles at the core. My goal is to help lead them to answer the question, “Why does this matter?” and, in so doing, help them learn to ask, and answer, the question when on their own. I think the virtual classroom dynamics can be attributed to the instructor’s decision to use WordPress.com as a platform for remote participations, and innovation to let students play the role of discussion leaders. Well-organized course material and framework are also critical to the success. Overall, LIS 879 is a success under the design and inspiration by Sarah Roberts. The learning environment and dynamics are excellent. This was a nearly perfect class: engaging projects, great use of multimedia (I particularly loved skipping clunky old LearnUW for WordPress + iTunesU). This course was well organized and conveyed the main themes, technologies, and information surrounding current digital libraries. I learned so much about organizations such as HathiTrust and DPLA, and also got to work through creating my own collection on Omeka. Overall a wonderful class that I would recommend to anyone going into/considering digital libraries. This was my favorite class this semester – Sarah is a great instructor. I really appreciate how organized the class was. I will (and have already) recommend her to other students. This was a fantastic, well-designed and engaging course. I would recommend it to anyone interested in digital libraries. Prof. Roberts is an articulate and thoughtful instructor with a great grasp of current issues in the field.